As the 2010 gubernatorial race heats up, the Perry and White campaigns will need to make some strategic decisions about where and how to spend their resources. 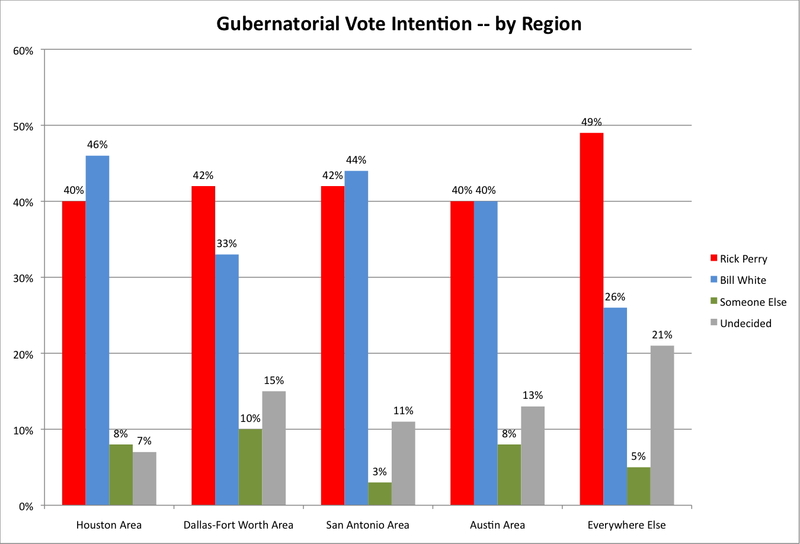 These decisions will be shaped by an important geographical reality underpinning the race: the dramatic differences between the degree of competition within the state’s four biggest metropolitan areas (which together account for roughly 66% of Texas’ population) and the degree of competition across the rest of the state (which accounts for roughly 33%). Perhaps more impressively, if the results for the Big Four Metro areas are combined, we discover that Perry leads White by only 41%-39% among all respondents from these areas. Given the poll’s 3.46% margin of error, this means that Perry and White are statistically tied in the Big Four. Perry’s statistically significant nine-point statewide lead over White in the poll is therefore largely owing to his dramatic lead among voters from everywhere else in the state. Who are these voters from everywhere else, anyway? Are they West Texas ranchers or East Texas small-town folk? Most of them are not. Generalized talk about “rural Texas” often obscures the fact that there are plenty of metropolitan areas in the rest of the state — El Paso, Lubbock, Midland/Odessa, Laredo, Amarillo, and Waco, to name a few. As it turns out, most of the people who live ”everywhere else” don’t live on a ranch or in a small town. They live in cities and suburbs, albeit smaller ones than in, say, the Metroplex. So how can we know whether Perry’s huge advantage in the rest of the state owes to his advantage in metro areas or his advantage with truly rural Texans? Our sample of 800 Texans is too small to analyze this question in a great amount of depth. However, we can classify respondents according to the counties in which they live. The U.S. Census has a three-pronged system for classifying counties based on population density. First, counties that are part of a core urban area of over 50,000 residents are known as “metropolitan counties.” Today, the vast majority of Americans and Texans live in metropolitan counties. Second, counties that are part of a core urban area of between 10,000 and 50,000 residents are known as “micropolitan counties.” In Texas, micropolitan counties include places like Nacogdoches County in East Texas or Howard County (Big Spring) in West Texas. These sorts of places are quasi-urban, and whether or not you consider them urban or rural depends on your own particular point of view. Finally, counties without a core urban area of greater than 10,000 residents are known as “Non-Core Counties.” These, of course, are the remote, indisputably rural counties. In Texas, there are 131 of them, but they only account for around 6% of the state's population. The table below shows gubernatorial intention only among respondents who do not live in one of the Big Four metro areas of the state. It breaks these respondents down by whether they live in a metropolitan, micropolitan, or non-core county. As can be seen, Perry holds a decisive lead among voters in each of these county types, including metropolitan counties. Perry’s lead among residents of metropolitan counties is even more impressive when we consider that this category includes respondents from predominantly Hispanic border counties such as El Paso, Cameron, and Webb, which are overwhelmingly Democratic. 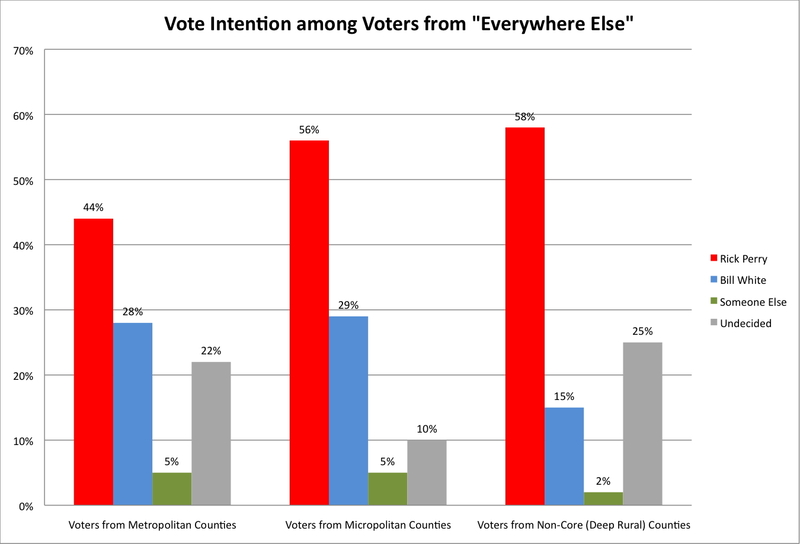 On the other hand, Perry’s lead among residents of micropolitan and non-core counties is huge. Truly rural voters aren’t the only reason that Perry is leading White among voters from the rest of the state, but they clearly play a role. Thus, Bill White’s problem is an “everywhere else” problem, which is only partly rural in nature. The question for White’s campaign is what to do about it. On the one hand, the media markets in metropolitan areas like Lubbock, Wichita Falls, or Longview are incredibly cheap, so if White feels that he can sell himself to voters in and around these areas, it might be worth his money to try. On the other hand, many residents from “everywhere else” could well be unshakeable Perry supporters, in which case it would make more sense for the White campaign to focus on suburban voters in the Big Four metro areas (with whom he badly needs to improve his performance). Conversely, Perry’s campaign has to decide whether its chief strategy should be to bolster support and turnout from “everywhere else” in Texas, or to convince undecided voters in the Big Four to support Perry on Election Day. No matter what strategies the two campaigns pursue, one thing is clear — the geographical divide between the biggest metros and the rest of the state will be of utmost importance in the way this campaign unfolds. This article originally appeared in The Texas Tribune at http://www.texastribune.org/2010/05/27/perrys-lead-over-white-is-not-from-the-big-cities/.